The joy of cargo bikes is blossoming in North America by all accounts. I wrote a piece about Danish cargo bike culture, and the many brands available, in a post for the Los Angeles Times a while back. You'll often see cargo bikes here or over at Copenhagen Cycle Chic. One of our readers, Dave, sent me a link to a cargo trike company out of Philadelphia called Haley Trikes and it is wonderful to see some home-grown trikes in production in North America. I did warn Dave that if I found a page on the website featuring strange 'how to dress for riding your cargo bike' suggestions, I would promptly hunt him down and ding my bell angrily in his general direction. Fortunately, the Haley Trikes site has all the right moves. In no-nonsense terms it highlights the practicality of cargo trikes in the urban environment and does so with ease and boyish enthusiasm. Quite refreshing, after all we've been discussing lately here on the blog. If you showed a photo of the Haley Trike to anyone in Northern Europe they'd just shrug and say, "that's a Christiania Bike" - a Danish brand that has become synonomous with this style of cargo trike. So there are no design milestones passed with the Haley, but it doesn't really matter. The trikes look cool and practical, especially with the host of colours and customizability available. Here's a groovy little video of the Haley Trike in action on the streets. The website shows many different ways of using the trike and all the things you can transport with it. I suppose it's important to spell it out for their target group. Although it's funny to think that only a few generations ago these kinds of bikes were muscling about the streets of Philadelphia and other cities, so it's not exactly THAT 'new-fangled'. 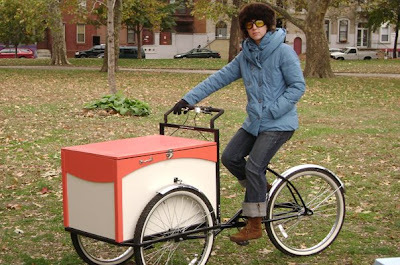 The cargo trike seems to be a splendid addition to streets in North America and the UK. It's stabile and secure, cars give it a wider berth - maybe the novelty factor is in play here, but that's fine - and it is a traffic-beater. The trike is a staple here in Copenhagen and Denmark. If you want two-wheeled cargo goodness and fancy a bit of speed, there is always the groovy Larry vs. Harry. 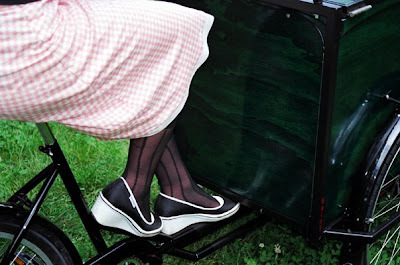 For classy two-wheeled elegance, there's the Velorbis Long John. But the cargo trike is the workhorse of the streets and there must be a good reason that it is the preferred style of cargo bike for so many. One thing I find curious about the Haley Trikes is that they don't show any children being transported. I know, I know, it's not as widespread an idea in America, but still, I'm wondering why they don't even present it as a option. Anybody seen a Haley up close?